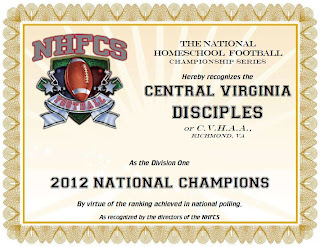 The Division One Champions, Richmond Disciples of CVHAA, has had a phenomenal season, completing the year without a loss. Several outstanding individual performances were recognized on the Disciples team, and several team accomplishments were set to higher heights than ever before. The Disciples sealed their national position by handing perennial powerhouse, Maryland Christian, an end to their undefeated run in the NHFA Tournament, in Panama City Beach last month. The Division Two Champions, Stephenville Knights of FAITH, has had a second straight Texas title in the TCAL State Tournament. As a 6-man team, Stephenville plays several Charter, Private, and Homeschool teams. They were one of the 4 homeschool teams who dominated the TCAL postseason state tournament. It was only by winning the state title that they were able to stave off powerhouse, Tomball Homeschool Warriors, for the national honors. This is Stephenville's second straight national title. This year, the NHFCS monitored the progress of over 130 teams which homeschoolers play for. We continue to research the explosive development of homeschool tackle football and strive to honor all the athletes whose families choose a home-based education track.